The Transform node receives an image as an input and moves, rotates and resizes it based on the transform attributes. When the Transform node is Active, the Transform Manipulator is displayed. The image has been rotated and scaled in X and Y. Drag the Transform icon into the Node Graph. Connect the output of an image node into the Img input in the Transform node. 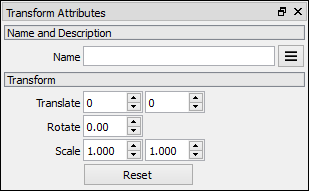 Adjust the attributes of the Transform node to transform the output image. In the Image Viewport manipulate the Transform node to transform the output image. The Image to be moved, rotated and scaled. The moved, rotated and scaled image. Amount of pixels that the image will be translated in X. Amount of pixels that the image will be translated in Y. Degrees that the image will be rotated. Scales the image along the X axis. Scales the image along the Y axis.